Controlled breathing not only affects one’s stamina and speed but can also condition a body to receive a blow and augment the power of a blow directed against an opponent. Through practice, breath stopped in the state of exhaling at the critical moment when a blow is landed against a pressure point on the body can prevent a loss of consciousness and stifle pain. A sharp exhaling of breath at the moment of impact and stopping the breath during the execution of a movement tense the abdomen to concentrate maximum effort on the delivery of the motion, while a slow inhaling helps the preparation of the next movement. An important rule to remember; never inhale while focusing a block or blow against an opponent. Not only will this impede movement but it will also result in a loss of power. Students should also practice disguised breathing to conceal any outward signs of fatigue. An experienced fighter will certainly press an attack when he realizes his opponent is on the point exhaustion. One breath is required for one movement with the exception of a continuous motion. By applying the impact force onto the smallest target area, it will concentrate the force and therefore, increase its effect. For example, the force of water coming out of a water hose is greater if the orifice is smaller. Conversely, the weight of a man spread out on snow shoes makes hardly any impression on the snow. The blows in Taekwon-Do are often concentrated onto the edge of the open palm or to the crook of the fingers. It is very important that you should not unleash all your strength at the beginning but gradually, and particularly at the point of contact with your opponent’s body, the force must be so concentrated as to give a knock-out blow. That is to say, the shorter the time for the concentration, the greater will be the power of the blow. The utmost concentration is required in order to mobilize every muscle of the body onto the smallest target area simultaneously. In conclusion, concentration is done in two ways: one is to concentrate every muscle of the body, particularly the bigger muscles around the hip and abdomen (which theoretically are slower than the smaller muscles of other parts of the body) towards the appropriate tool to be used at the proper time; the second way is to concentrate such mobilized muscles onto the opponent’s vital spot. This is the reason why the hip and abdomen are jerked slightly before the hands and feet in any action, whether it be attack or defense. Remember, jerking can be executed in two ways: laterally and vertically. Balance is of utmost importance in any type of athletics. 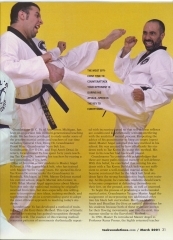 In Taekwon-Do, it deserves special consideration. By keeping the body always in equilibrium, that is, well balanced, a blow is more effective and deadly. Conversely, the unbalanced one is easily toppled. The stance should always be stable yet flexible, for both offensive and defensive movements. Equilibrium is classified into both dynamic and static stability. They are so closely inter-related that the maximum force can only be produced when the static stability is maintained through dynamic stability. To maintain good equilibrium, the center of gravity of the stance must fall on a straight line midway between both legs when the body weight is distributed equally on both legs, or in the center of the foot if it is necessary to concentrate the bulk of body weight on one foot. The center of gravity can be adjusted according to body weight. Flexibility and knee spring are also important in maintaining balance for both a quick attack and instant recovery. One additional point; the heel of the rear foot should never be off the ground at the point of impact. This is not only necessary for good balance but also to produce maximum power at the point of impact. Mathematically, the maximum kinetic energy or force is obtained from maximum body weight and speed and it is all important that the body weight be increased during the execution of a blow. No doubt the maximum body weight is applied with the motion of turning the hip. The large abdominal muscles are twisted to provide additional body momentum. Thus the hip rotates in the same direction as that of the attacking or blocking tool. Another way of increasing body weight is the utilization of a springing action of the knee joint. This is achieved by slightly raising the hip at the beginning of the motion and lowering the hip at the moment of impact to drop the body weight into the motion. In summarizing, it is necessary to point out that the principles of force outlined here hold just as true today in our modern scientific and nuclear age as they did centuries ago. I am sure that when you go through this art, both in theory and in practice, you will find that the scientific basis of the motions and the real power which comes out a small human body cannot fail to impress you. According to Newton’s Law, every force has as equal and opposite force. When an automobile crashes into a wall with the force of 2,000 pounds, the wall will return a force of 2,000 pounds; or forcing the end of the seesaw down with a ton of weight will provide an upward force of the same weight; if your opponent is rushing towards you at a high speed, by the slightest blow at this head, the force with which you strike his head would be that of his own onslaught plus that of your blow. The two forces combined; his, which is large, and yours, which is small is quite impressive. Another reaction force is your own. A punch with the right fist is aided by pulling back the left fist to the hip. Speed is the most essential factor of force or power. Scientifically, force equals mass multiplied by acceleration (F=MA) or (P=MV²). According to the theory of kinetic energy, every object increases its weight as well as speed in a downward movement. This very principal is applied to this particular art of self-defense. For this reason, at the moment of impact, the position of the hand normally becomes lower than the shoulder and the foot lower than the hip while the body is in the air. Reaction Force, breath, control, equilibrium, concentration, and relaxation of the muscles cannot be ignored. 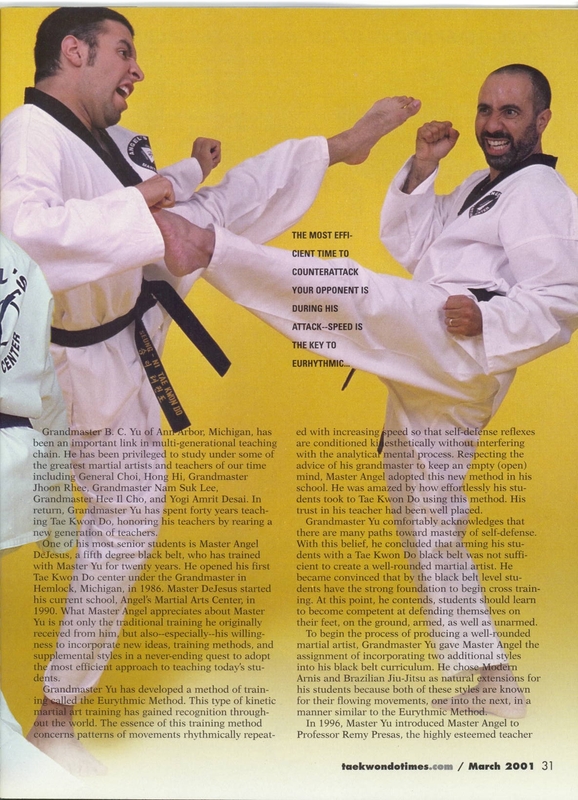 However, these are the factors that contribute to the speed and all these factors, together with flexible and rhythmic movements, must be well coordinated to produce the maximum power in Taekwon-Do.